After the interesting experience of crossing the Lesotho land border, we returned to South Africa and continued our journey to Royal Natal National Park in the Drakensberg (A mountain range in Eastern South Africa). Once again we were surrounded stunning landscapes. Our accommodations overlooked an impressive rock formation called The Amphitheatre, a cliff face named after it’s half-moon shape and multiple levels. Can you see the tiger? The hole is the mouth and the falls are the fangs. We were quite the busy bodies in the Drakensberg. On our first day we went on a short hike to the Tiger Falls which looked like the mouth and fangs of a tiger. On the second day we went on a horse trail ride through the park, marvelling in the scenery and on the third day we went on a 13km hike to the bottom of The Amphitheatre for a view of the Tugela falls (the second highest waterfall in the world). And in between we cooked up a storm, ate delicious home cooked meals, drank wine, and played hide-and-go-seek with Tyron’s little nephew Nathan. It was a very exciting and visually stimulating place to be. 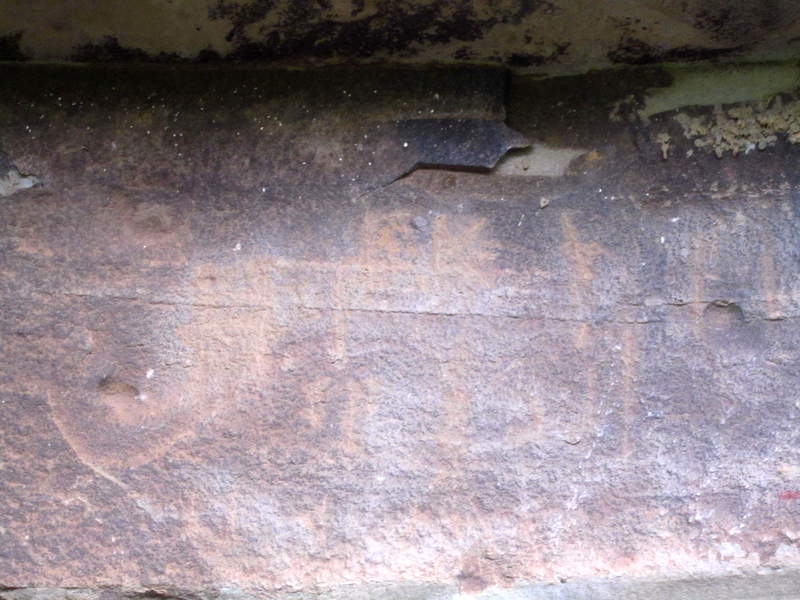 Rock art depicting a successful hunt. 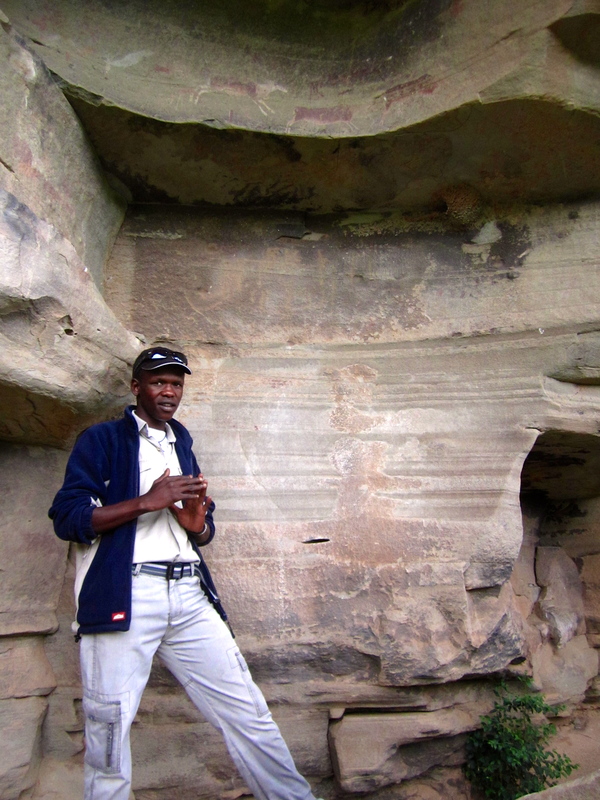 One of the most interesting things I saw in the Drakensberg was The Bushmen paintings. The Bushmen were the indigenous people of South Africa and the creators of the rock art in the photographs above. Their pictures tell stories which we can interprete to learn about their history and culture. Our guide interpreting the paintings. First we had to get to the paintings which was a twenty minute hike uphill. Along the way we spotted three very large baboons, sauntering along the path in the distance. I didn’t even realize that we had arrived at the location until Tyron pointed one of the paintings out to me, blended right in with the rock wall. The paintings were very stylistic with long curvy strokes depicting very tall figures with long limbs. They used three different colours. The black paint came from charcoal, the red and yellow paint from ochre and the white paint from gypsum. Our guide interpreted one of the paintings which depicted the celebration of a successful hunt of an Eland (the largest buck in South Africa) which would have provided the Bushmen with a feast. I loved the simple but intriguing style. These paintings were over 800 years old according to out guide, but unfortunately some of them have disappeared over the years. Tourists used to be able to go and see the paintings on their own but now it is mandatory to go with a guide since too many visitors were ruining the paintings. Some people would pour water on the paintings to bring out the colours for photographs which washed them away, while some people touched the paintings rubbing away the the pigment. Some people even carved their own names overtop of the paintings. It is heartbreaking that these historical paintings have been so damaged. There used to be a painting here before tourists rubbed it away and carved on top of it. I think human nature makes us want to want to scribble our name on anything we can possibly get our hands on. I know that when I walk past a fresh patch of wet cement, I get the urge to stick my hand in it to leave my mark. While I think it is fair to argue that The Bushmen paintings are also form of graffiti, they are also of a great historical importance and it is sad that tourists were ruining them. The people who ruined these paintings very likely had no clue what damage they were doing, but it does’t mean that it is okay. So whenever you are in nature, remember to take lots of memories and photographs and leave your mark only in footprints. Besides there is something beautiful about the impermanence of foot prints isn’t there? ← Lesotho: A country in a country.